Santa Fe is a cultural oasis, but it also offers some wonderful landscapes for outdoor activities. During your bed and breakfast stay at Four Kachinas, we recommend hiking in Santa Fe, especially if you visit this spring. This will allow you to better explore our region and discover the many natural wonders that await! Unique altitudes and terrains mark local hiking trails, creating an entirely new environment from what you are most likely used to. And the breezy spring weather provides the perfect atmosphere for outdoor exploration- not too hot, not too cold. That makes hiking in Santa Fe both an adventure and a challenge! It’s time to plan your spring getaway to Four Kachinas Inn! Mild temperatures create the perfect environment for a variety of outdoor adventures, such as hiking in Santa Fe. After your exciting day of explorations, retreat to our bed and breakfast for a peaceful evening. Spring in Santa Fe means warm day and cool nights, with temperatures ranging from the 20s at night to the 70s midday. Mostly, the weather hovers around a sunny 50 to 60 degrees, allowing for ideal hiking in Santa Fe. Some of our favorite local trails to explore in the springtime travel through forests, up mountains, and by petroglyphs. You don’t want to miss out on these great routes for hiking in Santa Fe! Atalaya Mountain with its still-snowy peaks is a 6-mile stretch with gorgeous views. Or, hike the La Piedra Trail featuring 3 miles of shady pine forests and bubbling creeks. Discover petroglyphs crudely carved into volcanic rock on the Boca Negra Canyon Trails. Or, climb Kiva ladders and weather rocky terrain along the Tsankawi Ruin Trail. With such refreshing weather, you will want to stay outside through the late afternoon! If hiking was just one of the items on your itinerary, you can fill the empty slots with a few of these other great outdoor activities. Shop the outdoor market at The Plaza for one-of-a-kind gifts and souvenirs to bring back home. Or take to the sky with a thrilling hot air balloon ride! A rafting adventure with New Mexico River Adventures is sure to let you make your splash on Santa Fe. And if hiking in Santa Fe is a little too strenuous, you can consider riding horseback down some of the same trails. Broken Saddle Riding Co. will take you over scenic hills and across a high desert ranch. A long day exploring the local landscape is nicely followed by a relaxing evening at our bed and breakfast. 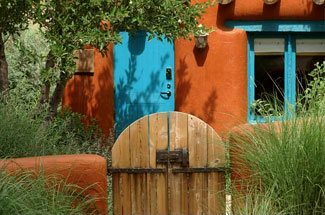 Four Kachinas Inn is the perfect home away from home during your Santa Fe getaway. Our Southwestern decor provides a warm, homey feel, while our gourmet breakfast each morning will start off your day right. 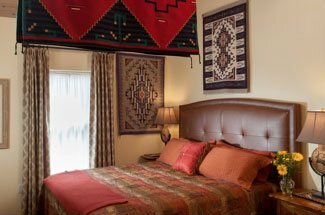 Browse our guest rooms and choose which one is right for you during your Santa Fe vacation this spring!